In time of conflict and stress I sometimes wake up in the morning with a feeling of hopelessness. 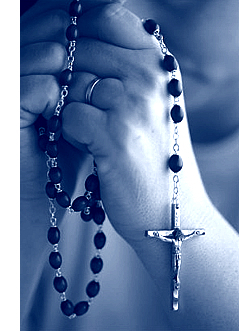 I mutter the prayers of the rosary and a tiny little sense of peace begins to quietly trickle through the knots of the turmoil caused by outer and inner disorder. Pope Paul VI proclaimed that there can be no peace without justice. Of course, everything disordered in the world, in the Church, and in our own souls causes peacelessness. John Paul II augmented his predecessor’s words to proclaim that there is no justice without transparency. The vicious circle is cover-up of injustice, and the resulting peaceless fears. How do we get out of the vicious circle? Our Savior – “the Prince of Peace” – tells us that the way out is up and then from the overflow of His love to begin the process of slowly unraveling the disordered knots. *You can find Our Lady of Knots on the web. The image shows her unravelling knotted yarn. There are prayers to go with the image.